You thought I was done didn't you? No one will contend that rebuilding the Brewers was a small task. It was a tall task to accomplish and he did an admirable job of changing the culture of a moribund franchise. This team is better than they were, but not as good as they could be. The 2010 offseason has presented several opportunities, some expected and some not. The first chance was taken, adding Shaun Marcum for the moderately high price of top prospect Brett Lawrie. Moderately high, but relatively low considering what a pitcher like Marcum would get paid on the free agent market. The other chip that Milwaukee has to improve their pitching predicament is All-Star first baseman Prince Fielder. The only problem with that trade chip is that no team is interested. Nobody wants to pay a premium for a player they'll have for one year and will demand a major payday afterward. That's not to say that the Brewers have no trade chips however. 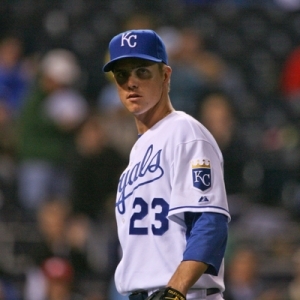 The farm system is stocked with talented players, prospects enough to make a major trade for a game changing pitcher - a pitcher like Zack Greinke - but only if Melvin is willing to pay the price. The Brewers have a small window left to contend with the team they have assembled. One year with the elite duo of Braun and Fielder. The offense is potent, one of the games best, but it won't stay that way forever. Yes, the farm system would be tremendously depleted. There would be holes encountered that would not be easy to fill two or three years down the line but sometimes you need to take that risk. Do you build a team to consistently be average? It's time to make a run, to make a bold move. Doug Melvin has no problem trading away star players, Carlos Lee and Richie Sexson learned that. And he has no qualms about adding a star player to fuel a pennant run, C.C. Sabathia was only two seasons ago. So what makes now different? Why wait until July to add a difference maker? Greinke makes Milwaukee an immediate favorite to take at least the wild card if not the division. He would also be more than a rental, since he is under contract for the next two seasons. The writing is on the wall for Melvin. If the Brewers don't make a return to the playoffs in the next two seasons his time at the helm is probably over. A new GM won't hesitate to trade away many of the players fans have enjoyed watching grow over the years. They are our guys... Milwaukee guys. And Milwaukee wants to see them win. So Doug, reward the team, a group that has won more games than that pitching staff deserved to. Reward yourself, you've turned a bottom feeder into a team that is a piece or two away from being great. But most of all, reward Milwaukee. The city that has been too patient with their ball club. They deserve a winner because they show up in force, year after year, to watch a loser. They deserve to be more excited for a baseball season than they have been in the last two decades. Give them something to be excited for.